With the passé of time, more & more people are embracing Ayurvedic treatment for treating the problems of hair falls and hair losses. These instances steal one’s self-confidence and esteem and can lead to embarrassing situations. If offered adequate treatment at the right time, Ayurvedic treatment can generate a complete solution to these troubles. As per the Ayurvedic principals, the problems of hair fall and hair losses are closely related to the type of the body and stability in the body-mind structure. Ayurveda considers the human hair a byproduct of the process of bone formation. Tissues that is crucial for bone formation fosters the growth of human hair. AS per Ayurveda, hair fall is a problem that results out of PITTA DOSHA. In Ayurvedic scripts, hair troubles arise when the PITTA DOSHA get to an alarmingly high state. Ayurvedic treatment is held in high regards for its effectiveness. The usual remedies to hair losses and falling hair in Ayurveda includes meditation, yoga, diet as well as the application of herbal products. As hair falls and losses are the outcome of PITTA DOSHAS, you require identifying the unhealthy eating habits that make major contribution to enhancing the PITTA in the body. PITTA gets enhanced if you drink tea, coffee or alcohols excessively. Chain smokers stand similar challenges as well. If you take meat in very high volume, you will experience a drastic rise in the PITTA level in your body. Individuals whose diet includes greasy, spicy, oily, and fires foods, use to have abnormally high level of PITTA. • Aloe Vera: Take about one-third cup of fresh Aloe Vera juice daily empty stomach. Alternatively, you can mix a teaspoon of Aloe Vera Gel with 2 pinches of cumin and take it before breakfast. You require applying this remedy for 90 days to get a complete solution to hair problems. • Drinking juices of fresh carrot, lettuce, Spinach and Alfalfa will even come highly effective to solve the hair troubles. It will be wise to include the juice in the breakfast menu. • Consuming a teaspoon sesame seed powder empty stomach daily will give you 100% solution to hair problems. Sesame seeds come loaded with calcium and magnesium. • Individual that consumes Yoghurt daily can control the hair fall and hair loss troubles effectively. • If you are looking for an effective solution to the problems of hair falls and hair losses, you need to include fruits and green leafy vegetables in your diet. These items come loaded with fiber that holds magical properties to prevent hair fall. • You inevitably need to include yeasts, sprouts, buttermilk, nuts, soybeans, dairy products as well as whole grains in your diet plan. These items are rich sources for Vitamin B-complex and vitamin C as well as sulfur, Zinc and other useful fatty acids that can boost the health of your hair. Adopting these items, you can solve the hair problems within a while. • Toxins cause severe damage to your hair and hence, you need to eliminate toxins from your body. To accomplish this, you require drinking water profusely. Keeping the body hydrated will enable you to escape the skin diseases as well. • BHRINGARAAJA: This Indian herb facilitates fast hair growth and it reverses premature graying and baldness. It even calms the mind and promotes the quality of sleep. You can take this herb internally as well as adopt external application in forms of herbal oil. • BRAHMI: This is yet another effective Herb for treating hair problems. You require mixing it with Curd and apply it as hair pack before bath. • Indian Gooseberry: It comes loaded with Vitamin C and can offer a delightful solution to the troubles of falling hair. This fruit is a wonderful antioxidant. You can apply oils of this fruit as hair message or can mix its paste with curd and apply on hair. • NEEM: One of the best agents to fight infections, NEEM is a gallant remedy against Lice and dandruff as well. In addition, NEEM even purifies the blood and eliminates toxins. You require forming a paste with fresh NEEM leaves and apply it on your hair. Alternatively, you can soak a few handfuls of fresh NEEM leaves in a large bucket of water and bathe with it. • RITHA: This fruit is the best natural shampoo that can treat hair falls, dandruff, and lice. You need to form a paste with these fruits and apply as shampoo. Apply this remedy 3 to 4 times a week for a few months. So fair Ayurvedic treatment for falling hair or hair losses are concerned, medicated and/or herbal oil massages are among the best remedies. You have got options like coconut oil, Hibiscus oil, Mustard oil as well as Arnica oil to choose from. These oils boost the hair follicle and hence, promote the rate of hair growth. You can even mix powders or extracts of herbs like NEEM, Indian Gooseberry, and Ritha to make the remedies stronger. You require massaging the hair with these oils before bathing. Regular application of these oils will promote hair health and will enable you to overcome the troubles of hair falls and hair losses within a short span of time. The remedies and lifestyle modifications suggested in the paragraphs above have proven its worth in fight the hair troubles. It is especially relevant t state that these remedies and approaches offer comprehensive benefits to the health. Hence, you are ought to reap manifold benefits, should you embrace these recommendations. Most importantly, these remedies and natural and hence comes effective and safe to your health. Hence, you will do wisely if you embrace these remedies rather than opting for the artificial and synthetic formulations to fight the problems of hair fall and hair loss. Hair loss and baldness are one of the common problems in the youth now. Unhealthy lifestyle, diet are the major causes for this problem. Nothing to worry here is a simple remedy that will act as a hair tonic. Indian is well-known for enriching hair growth and hair pigmentation. The fruit cut into pieces is dried preferably in the shade. These pieces are boiled in coconut oil till the solid matter becomes like charred dust.This darkish oil is an excellent oil to prevent greying. Whitening or graying of the hair is one of the common problems in the youngsters of the modern world. It might be from the heredity, lifestyle or environmental issues. Many follow different techniques blindly without knowing the proper knowledge, will lead to worsening the effects. Apple cider vinegar (ACV) is a well-known folk remedy to treat many health conditions. I’ve already written on how to use ACV to lose weight, reduce cholesterol and control blood sugar levels. You can also use it to remove skin tags and warts, as an effective cleansing face wash and in detox drinks. Treating dandruff, itchy and dry scalp – ACV has antibacterial and antifungal properties that help treat itchy, dry scalp. You can get detailed information in my article on how to use ACV to get rid of dandruff and in my article about the best home remedies for dry, itchy scalp. works as a natural detangler – so can replace conditioner. Your other option for a natural detangler is coconut oil and you can read about it in my post: 8 ingenious ways to use coconut oil on your hair. First of all, you need to use the right kind of ACV. Choose raw, organic, unfiltered, and unpasteurized kind of ACV. Not the refined kind you find in most stores. Buy a good quality kind of ACV that contains the “mother” of vinegar, which is the cloudy stuff that sinks to the bottom of the bottle. This substance contains the beneficial enzymes, bacteria, pectin and trace minerals that makes ACV so good for you. It’s also a good idea to shake the bottle each time before using ACV to distribute the elements. You can even easily make your own natural ACV. You can even include herbs in the rinse (previously infusing them in the water). Thus you can add lavender for a great scent or rosemary to encourage hair growth. You can also add a few drops of the best essential oils for healthy hair. Prithvi mudrā and Kapha-kaarak mudrā or prana mudra is very much useful to prevent hair loss and hair fall. 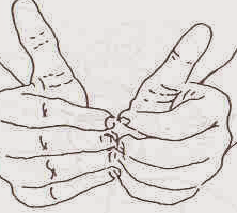 Prithvi mudrā can be formed by joining the tip of the ring finger with the tip of the thumb finger. This mudrā increases earth element within the body which helps to prevent hair loss and hair fall. Pran mudrā also increase earth element within the body and increases Kapha humor which helps to strengthen the hair. Pran mudrā is the best mudrā to keep the hair healthy and to prevent hair fall and hair loss. Are you suffering from dry hair or unhealthy hair then Vaayu-shamak mudrā, Prithivi mudrā, jal-vardhak mudra, vaata-naashak mudrā, kapha-kaarak mudrā, and appan mudrā are very much beneficial. Click on the link to know more about these mudras. Prithvi mudrā and Kapha kaarak mudrā or prana mudra are very much useful to hair regrowth. Just 30 to 45 minutes of practice will good result. Hand mudrā for hair growth: Prasanna mudrā is the best hand mudrā that helps you in regrowth of hair. Vaata-kaarak and pitta-kaarak mudrā are very much useful to overcome the greasy hair. PRASANNA MUDRA is also known as Hairdo Posture. This Mudra is beneficial in curing hair loss. How to perform Prasanna Mudra: Keep hand near the chest. Rub the nails of the eight fingers against each other for 5 to 10 minutes for 30 days. The thumbs should be straight.Benefits of Hairdo Posture: This slows down hair loss, with reduction of gray hair and split ends. It makes hair lustrous and strong. While improving disposition. 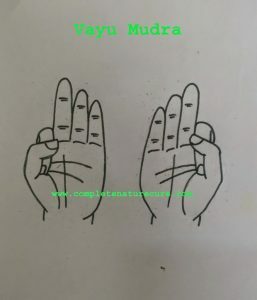 Mudra for premature graying of hair: Prithvi vardhak mudra is helpful to prevent hair loss and control premature graying.The increase in the earth element will help us to fight against hair loss.Also, this mudra decrease temperature of the body which will help us to calm our body survive in this summer. Paste prepared from fresh leaves and flowers of hibiscus should applied on the scalp for treatment of dandruff. It is good for hair growth too. hibiscus shampoo prevents hair fall. Indian gooseberry :Indian gooseberry has revitalizing effects. It has an element which is very valuable in preventing ageing and in maintaining strength in old age. It improves body resistance and protects against infection. It strengthens the heart, hair and Different glands in the body. The great ancient sage Muni Chyawan said it. rejuvenated himself in his late 70s and regained his virility by the use of amla. A fine paste made of Pigeon Pea pulse is highly useful in bald patches. It should applied regularly for better result. Dandruff is a condition that Excessive shedding of dead skin from the scalp. Skin cells die and flake off, so a little amount of flaking is normal. The scalp skin dies and flakes off in every month, while in those suffering from Dandruff, this happens every two to seven days. Apart from being a physical problem, dandruff is also associated with social and self-esteem problems in many individuals. 1. Over use of dry, cold, oily, spicy, and penetrating foods. 2. Hyperactivity of the sebaceous glands. 3. skins that are sensitive to seasonal changes. 4. Who live in a constant state of anxiety are prone to dandruff. 5. Excessive cosmetic hair treatments like hair-conditioning and hair-coloring, using hair curlers, perms, and hair-bonding . 1. The appearance of white flakes on the scalp. 3. Redness and irritation on the scalp. 4. The softness of the scalp skin. 5. Continuous itchy feeling on the scalp. According to the Ancient Ayurvedic texts, the problem of dandruff in the category of Shudra Roga, which appears due to an imbalance of all three Ayurvedic humor. The dominant doshas involved are Pitta and Vata. In an aggravated state, both the doshas cause the production of unique impurities, called ama, which are dry and heating in nature. These pollutants accumulate in the deep tissues of scalp and contaminate them. Contamination of the deep tissues and aggravated Vata-Pitta Dosha can cause itching and patches on scalp. Due to these factors, the scalp sheds larger than normal amounts of dead epidermal cells, which leads to the problem of dandruff. The Ayurvedic line of treatment is to generally pacify Pitta and Vata through herbal medicines, as well as a tailor-made diet and lifestyle plan. Also, individual herbs are administered to cleanse the body of accumulated digestive impurities. 1. Wash hair regularly two to three times a week with a mild shampoo. 2. Massage your hair with oil every time before washing the head and hair. 3. Avoid spicy, greasy, hot and penetrating foods, junk food, and aerated drinks. 4. Have food with good nutritive value; include fiber-rich foods, salads, fruits, and lentils. 5. Do regular yoga and exercises to minimize stress levels. 6. Avoid scratching the scalp with hands or any other objects. 1.Mix two to three teaspoons of coconut oil with one teaspoon of Indian gooseberry juice. Gently massage the scalp with this every day. Add ten drops of lemon juice to 1 egg white and beat well. Apply to the scalp and hair once a week. 2. Mix 1 teaspoon lemon juice, one tablespoon mustard oil, and 1 cup yogurt. Apply this to the hair thirty minutes to 1 hour before washing the head and hair. 3. Soak fifty gm methi dana in two cups of water overnight, next day in the morning make the paste and apply on scalp for fifteen minutes. Chew ten holy basil leaves, ten margosa leaves, and ten bael leaves on an empty stomach early in the morning. Many people assume that dandruff and dry scalp are the same condition but actually they are not. It is very easy to make that assumption because both dandruff and dry scalp can make the skin on the scalp itchy and cause dead flakes of skin to form. You may become aware that you have dandruff or dry scalp when you brush or comb your hair and dead skin flakes get shed and fall onto clothes, especially on and around the shoulders. The causes of these conditions differ greatly, and to successfully treat a scalp that is dry or to get rid of dandruff completely, it’s necessary to find out the root cause. You can use many different home remedies to treat dry scalp conditions and dandruff. In this article, I am going to look at the differences between the causes of dry scalp and dandruff and what simple homemade treatments are effective in reducing itchiness and stopping dead skin flaking off in your hair. Dandruff vs Dry Scalp – What are the Differences? It is sometimes difficult to tell the difference between dry scalp and dandruff. Over washing your hair can cause a dry scalp, which is a common cause of dandruff. However, the causes of dandruff are more than just having a dry scalp. Dandruff can also be due to scalp infections, oily skin, or an irritated scalp. Dandruff is defined as “the flaking of dead skin cells from the scalp.” According to doctors at the Mayo Clinic, there are a number of reasons why a person can have dandruff, and a dry scalp is just one of them.1 If you notice that the flakes of dead skin are white or yellowish and you have patches of red, greasy skin on your scalp, the cause of your dandruff could be seborrheic dermatitis. Alternatively, the scaling on your scalp could be due to a yeast-like fungus called Malassezia. When this fungus starts to overgrow, it causes more skin cells to grow and makes the scalp itchy. The white flakes of skin then shed from your scalp. Poor personal hygiene can also cause dandruff with some people because they don’t wash their hair enough. Infrequent shampooing results in a buildup of dead skin cells and oils on the scalp. This can cause infections to occur and feed fungus on the scalp, making dandruff even worse. You can tell if your dandruff is caused by dry skin because generally, the flakes of dead skin in your hair and on your clothes will be smaller and less greasy than skin flakes from other causes of dandruff. There are many effective home remedies to treat the symptoms of dandruff, and some of them help to treat dry scalp as well. Here are some of the best. Tea tree oil is one of the best all-around essential oils to keep your hair and scalp healthy and is a great home remedy for dandruff conditions. Tea tree oil can effectively treat bacterial infections, scalp psoriasis, oily skin, and kill off fungus infections that cause dandruff. Various studies into the effects of tea tree oil in treating the root causes of dandruff conditions have shown it to be an effective natural remedy that destroys various infections. For example, the Skin Pharmacology Society published a study in their journal showing that tea tree oil is effective in treating dandruff caused by seborrheic dermatitis and killing off other fungal infections on the scalp.3 Other studies have shown that 5% tea tree oil shampoo destroys the fungal infections responsible for dandruff. Add 8-10 drops tea tree oil to every 8 oz. of your favorite natural shampoo. Wash your hair as needed with the tea tree shampoo. Use the 5% tea tree oil shampoo regularly to get rid of dandruff, get relief from an itchy scalp, and prevent fungal infections irritating your scalp. You can also use raw apple cider vinegar as a natural home remedy to help cure dry, flaky skin on your scalp and reduce itchiness. Many shampoos and soaps contain harsh chemicals which can disrupt the pH balance of your scalp. ACV can help to restore a healthy pH balance to alleviate itching on your scalp. Also, its high acidic content helps to kill off bacterial and fungal infections. Dilute equal parts of ACV and water and apply to your scalp with a cotton ball. Wrap your hair in a shower cap and cover with a towel. After 10-15 minutes, rinse off with warm water and style as normal. Use the apple cider hair rinse once or twice a week to effectively control dandruff and get rid of an itchy and dry scalp. Virgin coconut oil has many antibacterial and antifungal properties that can help clear up dandruff and treat an itchy and dry scalp that is caused by dermatitis or a yeast infection. Also, the fatty acid content of coconut oil makes it a great scalp moisturizer to keep your hair looking shiny and healthy. Regarding the antifungal activities of coconut oil on the Malassezia fungus species, the Indian Journal of Medical Research reported that coconut oil can help prevent dandruff that is caused by a fungal infection. Another study published in 2008 found that coconut oil helps to reduce the symptoms of dermatitis, including dry and itchy skin. Wash your hair with your favorite natural shampoo. Massage 1-3 tbsp. virgin coconut oil into your scalp (you can warm the coconut oil first, but the oil melts with body temperature as well). Cover your hair with a shower cap and wrap your head in a towel. Leave for 1-2 hours and then rinse the oil from your hair and shampoo again to remove any excess oil. Use the coconut oil treatment 1-2 times a week to keep your scalp moisturized and free of any flakes of dead skin. You will also notice that coconut oil restores a natural shine to your hair. There are also many other reasons to use coconut oil on your hair. Aloe vera is an excellent home remedy to help cure dandruff and relieve dry, itchy scalp. It is a well-known fact that aloe vera is a great soothing agent for dry and damaged skin. You can also apply aloe vera directly to your scalp to get rid of scaly, dry, and flaky skin. If your dandruff looks like yellowish flakes of dead skin caused by seborrheic dermatitis, you can use aloe vera on your scalp to help heal the scaly scalp. For example, a report published in the Natural Medicine Journal said that aloe vera can help to treat the symptoms of seborrheic dermatitis if you apply it twice a day.6 Some studies have also shown that aloe vera can help treat the symptoms of psoriasis like flaking skin and itchiness. To help get rid of dandruff or dry scalp, apply pure aloe vera gel directly to your scalp and leave for 15-20 minutes before rinsing off. Repeat the aloe vera application 2-3 times a week to help keep your scalp moisturized and to prevent dandruff. If your dandruff is the result of an oily scalp or a buildup of dead skin cells and you don’t have a dry scalp, you can try baking soda. Many people have found that baking soda can be an effective natural remedy to help remove excess oil from an oily scalp and eradicate the infections that can cause dandruff as well as helping to reduce the sensation of scalp itchiness. Take a handful of baking soda and make a paste in your palm with a few drops of water. Rub the baking soda paste into your scalp. Wash thoroughly after one minute and don’t use shampoo afterwards. Many people who use baking soda as a home remedy for dandruff find that it dries their scalp. So, if you suffer from a dry scalp, you should use one of the other dandruff remedies in this article. In order to treat the symptoms of dry scalp, it is important to moisturize the scalp properly. Very often, home remedies for dry and flaky scalp involve applying natural oils to the scalp. Therefore, some of these home remedies may be better used only if your dandruff is caused by a dry scalp. Apart from being delicious to eat, honey has powerful antimicrobial and antifungal properties that make it an excellent natural remedy for dry, itchy scalp. Honey is also a natural moisturizer and you can use it to help treat dandruff that is caused by dry skin. Raw, natural honey relieves most dry scalp symptoms and will stop you feeling a constant urge to scratch itchy patches of skin on your scalp. Wash your hair with a natural shampoo or with the 5% tea tree oil anti-dandruff shampoo mentioned in this article and leave your hair damp. Mix 9 parts raw honey with 1 part warm water (as was done in the above study). Massage into your scalp for 2-3 minutes to allow the honey to penetrate the layers of dry, itchy skin. Cover with a warm towel and leave for 2-3 hours. Rinse the honey from your hair with warm water. For best results and to keep your hair free of dandruff and itchiness, use the honey hair mask once a week. You should find that within a few weeks you no longer have any dead flakes of skin and the symptoms of having a dry scalp will be gone completely. If you notice that your scalp is dry, itchy and you constantly shed small flakes of dead skin cells, you can try using olive oil to soothe and moisturize the dry skin on your scalp. Olive oil is a great natural hair care product and it contains natural antibacterial compounds that can help treat and prevent skin infections.8 Because it’s also been proven to be an effective natural treatment for the symptoms of dermatitis, it will also give you relief from irritated, inflamed skin. You can use a warm olive oil hair remedy to help moisturize a dry scalp and get rid of dandruff. All you need to do is warm up some olive oil and add 1-2 drops of tea tree oil if you want. Thoroughly massage the olive oil treatment to your dry scalp, cover with a towel and leave in your hair for at least 30 minutes. Wash out with a natural shampoo and when you dry your hair you will notice that it has regained its natural shine. Use the olive oil hair treatment mask once or twice a week until you no longer have a dry, flaky scalp. Alternatively, you can use the therapeutic properties of jojoba oil, avocado oil or sweet almond oil to make a warm oil hair mask to treat dry scalp conditions and get rid of scaling skin from your scalp. Dandruff is the major cause behind hair fall and baldness.Using chemicals or artificial products to remove will harm hair.Natural remedies are very useful to over come dandruff. Fenugreek is one of the best natural medicine to prevent dandruff.Eating soaked fenugreek helps to prevent hair fall,but here we are discussing about dandruff. Feenu greek seeds are useful in the removal of dandruff.Two tablespoons of the seeds should be soaked over night in water.In the morning ,the softened seeds should be ground into a fine paste.This paste should be applied all over the scalp and left on the head for half an hour.The hair should then be washed thoroughly with soapnut solution or shikakai.Paste of the fresh leaves of fenugreek applied over the scalp regularly is also useful in dandruff. Coconut oil is one of the best natural remedy to remove dandruff.Before going to bath take 5 table spoon of coconut oil into your scalp and let sit for about an hour. Shampoo normally. You can also look for a shampoo that already contains coconut oil. Lemon is an effective home remedy for dandruff to get an instant relief. Take two table spoons of lemon to you scalp and massage for five minutes then rinse with water. Then stir 1 teaspoon lemon juice into 1 cup water and rinse your hair with it. Repeat this daily until your dandruff disappears. Lemon’s acidity helps balance the pH of your scalp, which helps keeps dandruff at bay.